(Newser) – Last year, the FBI named the Juggalos, fans of the clown-faced hip-hop band Insane Clown Posse, as a "hybrid gang." 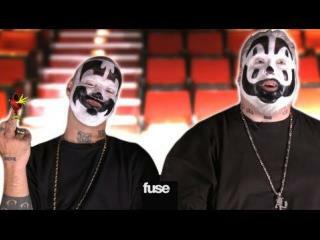 Now, the ICP is fighting back, telling fans yesterday that the band will sue the FBI, reports the Village Voice. The danger, says the band, is that as a "gang," fans who get charged with crimes now face much steeper sentences, as even minor offense can be treated as gang activity. Fans could also be kept off of airplanes or face problems at border crossings. This is wrong on so many levels. I happen to be an old woman & really like ICP's music. I have seen the police in my part of town just f*** with the Juggalos/Juggaletts for the mere fact there were more than 3 of them together. I have met some really awesome Juggalos. I can't say any of them made any impression that they were less than respectful, I never got any bad vibes off them that an aware person would get if a "criminal type" was around. Profiling these kids this way is just adding fuel to an already bad rap these kids & ICP get for expressing themselves in a manner that some people can't deal with. There really are truths to what they have to say, vulgar or what ever....I find a grip of crap the cops & closed minded people do & say vulgar. And as far as people blaming ICP for their kids deaths, well that really wasn't the problem. I am sorry for your loss & it is always sad to lose a kid, but there were already problems going that were seen & ignored, seen & misunderstood, or just ignored. Back when I was in late teens early 20's the people tried to blame Ozzy for people killing themselves. It's easier to lay blame than face the sad but real truth of depression, etc. that often leads to suicide. That being said, I support you cause Juggalos! WOOP! WOOP! What the FBI is doing to ICP & you all is the same as what the people do to Pit Bulls, people of color, & any 1 or any thing that is different or opposite to their idea of what is right you get profiled, sometimes they beat you, sometimes they kill you. They did it to us in the 60's because we were hippies. They always have to be busy where it shouldn't be & rarely looking where they should. And they also need for the "masses" to keep focused on this kind of crap so the brainwashed aren't paying attention to the real deal stuff with the things that matter. I'm not gonna say that Juggalo/ettes are criminals, but I've yet to meet one who was a fine, upstanding member of society with a good home life and a dependable family. Their target demographic is white, ignorant, poor kids who are either angry at their folks or who have absent parents. Yep, I speak from the 'los I know.